A Murut man in Monsopiad Cultural Village, Kg. Kuai Kandazon, Penampang, Sabah. 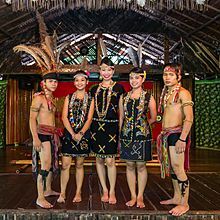 The Murut are an indigenous ethnic group, comprising 29 sub-ethnic groups inhabiting northern inland regions of Borneo. The literal translation of murut is "hill people". A large percentage of the Murut communities are in the southwest interior of Sabah, East Malaysia, specifically the districts of Keningau, Tenom, Nabawan and Beaufort along the Sapulut and Padas rivers. They can also be found inhabiting the border areas of Sarawak, (especially around the Lawas and Limbang areas, where they are also referred to as Tagal people), North Kalimantan (traditionally concentrated in Malinau and Nunukan) and Brunei. The Murut population in Brunei is mainly found in the sparsely populated Temburong district. They once supplied military might to the Sultans of Brunei. Their population has dwindled in recent years. They are defined as one of the seven indigenous groups that are considered to be Bumiputera in Brunei. The Murut are divided between lowland (Timugon) and highland (Tagol) subgroups. They speak the Murutic languages, a branch of the Austronesian family. The Tagol Murut language serves as their lingua franca. The Murut were the last of Sabah's ethnic groups to renounce headhunting. As with the Iban of Sarawak, collecting heads of enemies traditionally served a very important role in Murut spiritual beliefs. For example, a man could only get married after he presented at least one head to the family of the desired girl. Murut tribeswomen at a head feast in Sarawak, Malaysia. The Murut were shifting cultivators of hill padi and tapioca, supplementing their diet with blowpipe hunting and with some fishing. They live in communal longhouses, usually near rivers, using the rivers as their highways. Most have now converted to Christianity, with about a fifth of the population being Muslims. However they still maintain their culture. 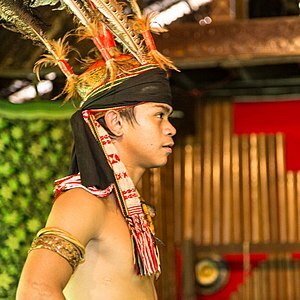 Traditional dress for men was a jacket made of tree bark (Artocarpus tamaran), a red loincloth, and a headdress decorated with Argus pheasant feathers. Women wore a black sleeveless blouse and sarong, which fell just below the knees. Like most of the other indigenous groups in Sabah, the Murut decorated their clothing with distinctive beadwork and also made belts out of old silver coins. Another belt made of reddish-brown glass beads plus yellow and blue beads was hung loosely around the waist. Murut wedding or funeral feasts can last several days. Ancient Chinese jars hold a prominent status in Murut customs. Jars are also a place of spirits, and larger jars were formerly used as coffins. The Murut have a musical heritage consisting of various types of agung ensembles - ensembles composed of large hanging, suspended or held, bossed/knobbed gongs which act as drone without any accompanying melodic instrument. Murut also used bamboo as a musical instrument, by using bamboo to compose a songs. Some musical instrument like tangkung (similar to that of a guitar, except it has only two strings) is made from wood. Tangkung is usually played during their leisure time. Antanum was a famous and influential Murut warrior from Sabah who according to local oral history claimed to have supernatural powers. Because of this he was able to receive support from the chiefs and villagers from around Keningau, Tenom, Pensiangan and Rundum and led the Rundum uprising against the British North Borneo Company but was killed during fighting with the company army in Sungai Selangit near Pensiangan. Traditional Murut longhouse in Penampang, Sabah, Malaysia. Antanum - Murut warrior against the British North Borneo Company but was killed during fighting with the company army in Sungai Selangit near Pensiangan. Stephen R. Evans - The Former of Senator and Malaysian parliament. Ahmad Koroh - The fifth of Head of State of Sabah. Mohamad Adnan Robert - The Sixth of Head of State of Sabah. ^ William W. Bevis (1995). Borneo Log: The Struggle For Sarawak's Forests. University of Washington Press. p. 152. ISBN 0-2959-7416-8. ^ Mercurio, Philip Dominguez (2006). "Traditional Music of the Southern Philippines". PnoyAndTheCity: A center for Kulintang - A home for Pasikings. Retrieved 25 February 2006. ^ * Regina Lim; Institute of Southeast Asian Studies (2008). Federal-state relations in Sabah, Malaysia: the Berjaya administration, 1976-85. Institute of Southeast Asian Studies. p. 29. ISBN 9789812308122. ^ Evans, Hilary; Gjerde, Arild; Heijmans, Jeroen; Mallon, Bill. "John Daukom Olympic Results". Olympics at Sports-Reference.com. Sports Reference LLC. Retrieved 15 August 2017. 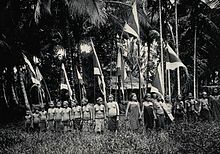 Wikimedia Commons has media related to Murut people.